Stainless steel films were reactively magnetron sputtered in argon/methane gas flow onto oxidized silicon wafers using austenitic stainless-steel targets. The deposited films of about 200 nm thickness were characterized by conversion electron Mössbauer spectroscopy, magneto–optical Kerr-effect, X-ray diffraction, scanning electron microscopy, Rutherford backscattering spectrometry, atomic force microscopy, corrosion resistance tests, and Raman spectroscopy. These complementary methods were used for a detailed examination of the carburization effects in the sputtered stainless-steel films. 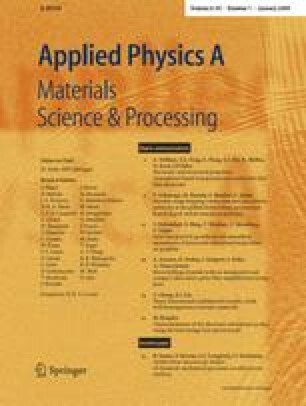 The formation of an amorphous and soft ferromagnetic phase in a wide range of the processing parameters was found. Further, the influence of the substrate temperature and of post vacuum-annealing were examined to achieve a comprehensive understanding of the carburization process and phase formation. P. Schaaf’s former affiliation: II. Physikalisches Institut, Universität Göttingen, Friedrich-Hund-Platz 1, 37077 Göttingen, Germany.